Article contains information about a scheduled or expected future album. The content may change as the album release approaches and more information becomes available. A Little Bit Longer will be the third studio album released by the Jonas Brothers. It is their third studio album and their second album to be released under Hollywood Records, and is set to be released on August 12, 2008. 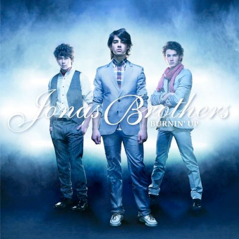 "Burnin' Up" is the album's first single and was officially released via radio stations on June 20, 2008. 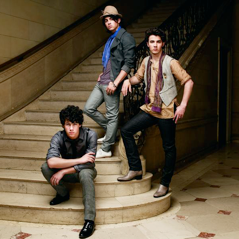 Also on that same day, the music video for "Burnin' Up" premiered on Disney Channel, following the premiere of Camp Rock. The title of the album, "A Little Bit Longer," comes from their song of the same name, which Nick Jonas wrote about his dealings with having diabetes. It has been confirmed that there will be twelve songs on the album. Timbaland announced that he had worked with the Jonas Brothers for this album. In a recent UK interview, the Brothers said that they hope to release the album in the UK by the end of 2008 or early 2009. 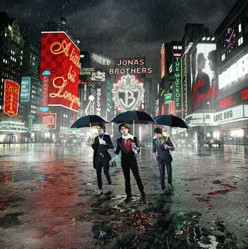 The album artwork was released by Team Jonas, the Jonas Brothers' official fan club, to fan club members via an e-mail newsletter on June 20, 2008. Like their last album, this one will also feature CDVU+ technology that includes more than 30 pages of bonus features with exclusive video performance, 60 printable photos, complete album lyrics, downloadable graphics, and hidden links. In addition, the packaging of the album will be made from 100% recycled materials. On June 24, 2008, iTunes announced that it would be releasing four songs from A Little Bit Longer, one roughly every two weeks. The purchase of each of the songs will go toward the price of the entire album, and one will be able to buy it using the Complete the Album feature after the album is released. Each song will also feature a new podcast episode from the boys. The schedule: June 24, 2008 for "Burnin' Up"; July 15, 2008 for "Pushin' Me Away"; July 29, 2008 for "Tonight"; and August 5, 2008 for "A Little Bit Longer." Kevin Jonas will be playing lead guitar, and singing background vocals. Joe Jonas is singing lead vocals, and playing keyboards, tambourine, and various other percussion instruments. Nick Jonas is singing lead vocals, and playing rhythm guitar, drums, and piano. In addition to the Jonas Brothers, John Taylor will play guitars on the record, Ryan Liestman will contribute keyboards, Jack Lawless will be playing drums, and Greg Garbowsky and Benjamin Williams will record the bass tracks. Despite earlier misconception that Timbaland is featured rapping on lead single "Burnin' Up," it is actually the boys' bodyguard, Big Rob. "Produced by John Fields (with Jon Lind and Kevin Jonas, Sr., serving as executive producers), "A Little Bit Longer" covers much musical and emotional ground, kicking off with the joyful jam "BB Good." Says Joe of the track, "It's a big sing-along song, and it's fun." The funky and danceable debut single, "Burnin' Up," keeps the party going, with Big Rob, the brothers' hefty security guard, rapping midtrack. "It's about this girl," adds Joe. "Maybe she's at a party, and you feel that immediate connection. You both know it's there." Though relentlessly upbeat, most songs on "A Little Bit Longer" explore star-crossed standoffs and missed romantic opportunities. Songs like "Shelf," the hard-rocking "Pushin' Me Away" and "One Man Show" survey love's unequal playing field, bad break-ups and the defiant isolation that follows. "'Shelf' is one my favorite songs on the record," says Nick. "Basically, it's about a girl that has a gallery of hearts." Other songs take a light-hearted look at the craziness of fame and fortune. "Video Girl" paints a portrait of the shallow wannabees dotting the entertainment landscape (" Move to L.A., got no talent/Not even like you won a Miss Teen pageant"), while "Lovebug" starts out as sweet-tempered acoustic love song before ending up a crashing Queen-like rocker. Of course, the brothers made sure the album breathes. The power ballad "Sorry" features classic JB harmonies and an eternal message of forgiveness. But the song that will have people talking is "A Little Bit Longer," Nick's stunning account of his struggle with diabetes. With strings underscoring a plaintive piano/vocal, he sings about his battle ("A little bit longer and I'll be fine/Waitin' on a cure/But none of them are sure"). Recalls Nick, "I was having one of those days where I was discouraged. So I went into this empty hotel ballroom and wrote this song." Adds brother Kevin, "Nick sings this song every night and it brings people to tears. It's amazing." The brand new album from the Jonas Brothers includes a 30 page CDVU+ experience including: Exclusive Video Performances 60 Printable Photos Complete Album Lyrics Downloadable Graphics Hidden Links Package Made from 100% Recycled Materials!" Fans that pre-order the album online before its release will receive a special DVD with it, which includes YouTube videos of the band and a special message to fans. This special edition is only available for pre-orders through their fan club, Team Jonas, their official merchandise site, and Music Today.